Do you have a nice landscaped yard? Lush green grass, blooming flowers, tall trees, stones in all the right places? Let me guess… you don’t own a dog? Especially not a Great Pyrenees. I tried so hard to bring our yard back to life after the frigid winter. At this point, we’ve decided to just live with it and have a professional take care of it when we move out. The majority of the grass is dead, there are craters everywhere, and if you’re not careful, you’ll turn your ankle. It’s killer out there! 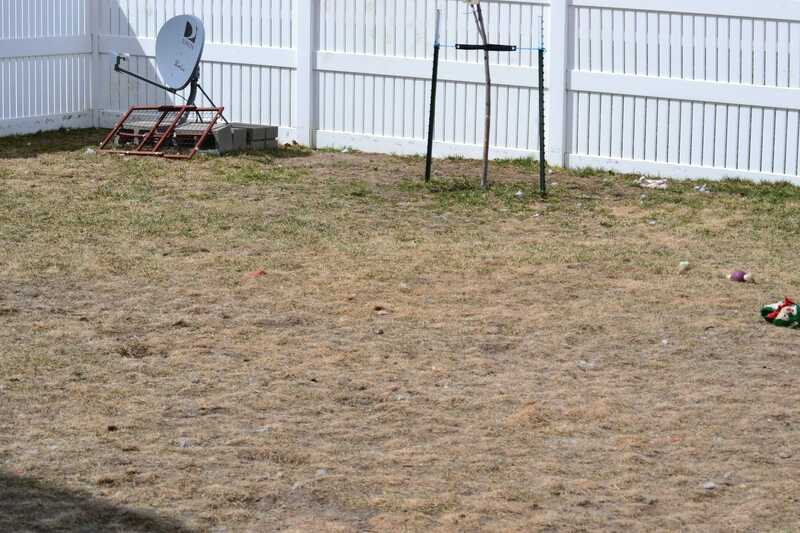 I know Mauja and Atka much prefer the yard in this state. The dirt is showing which gives them nice, cool spots to lay in the summer. Like they don’t have a nice air conditioned house to come into…sigh. I finally got fed up with our yard’s condition and decided that we needed to do something about it and set off on a mission to create a digging box. 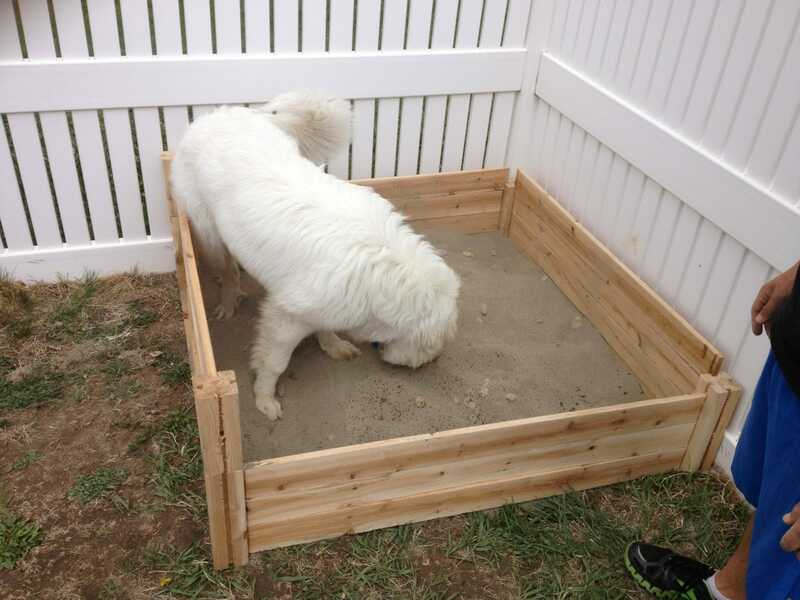 A digging box is basically a doggie sandbox. Off to Home Depot we went to get some wood and sand to build our own. I must say, that was a much easier route to go than trying to get wood cut and nailed together as we really don’t have any tools of our own. This kit came all pre cut and measured to build your own personal sized gardening box. We grabbed the kit, a piece of wood so she couldn’t dig through the bottom, and several bags of sand. The assembly began. It was a very easy process to accomplish and took us about 30 minutes. Now we just had to test it. Fingers crossed! It’s a winner! Now we occasionally bury toys and treats in the bottom of the digging box to keep her entertained. She loves going out there looking for treasure! 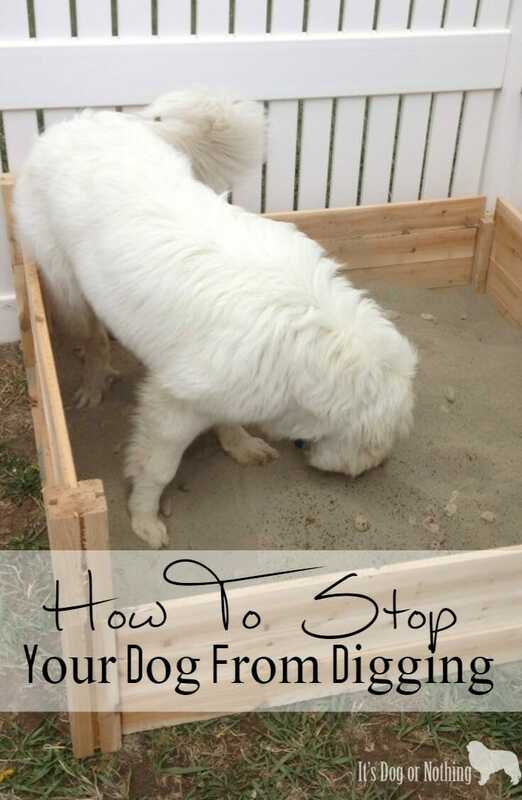 How do you keep your dogs from tearing up the yard? How is this working now? We had “Digger the diggiest dog” in our Retreiver/Lab mix; she died this spring and yesterday we adopted a Pyr pup. Shes only 4 months old, and we’ve had her less than 24 hours. Although I can live with craters (I’ve lived with them for 15 years), I’d rather not. If this sandbox works, I’m on it… Let me know! How did you get him to dig in the box and not the rest of the yard? How big did you end up making the “dig” box. Looking to do the same for out Pyrenees puppy as she has already took to trying to create several of her own spots at just 3 months old! I’ve read all the comments on the digging box my G.P is going on a year old and he digs so wide and so deep down like he is digging his way to china does anyone have any suggestions soon enough he will make his own tunnel like a fox hole. How deep to I make a digging box? Building a sandbox is really a great idea! If there is a video tutorial on it would be perfect! !